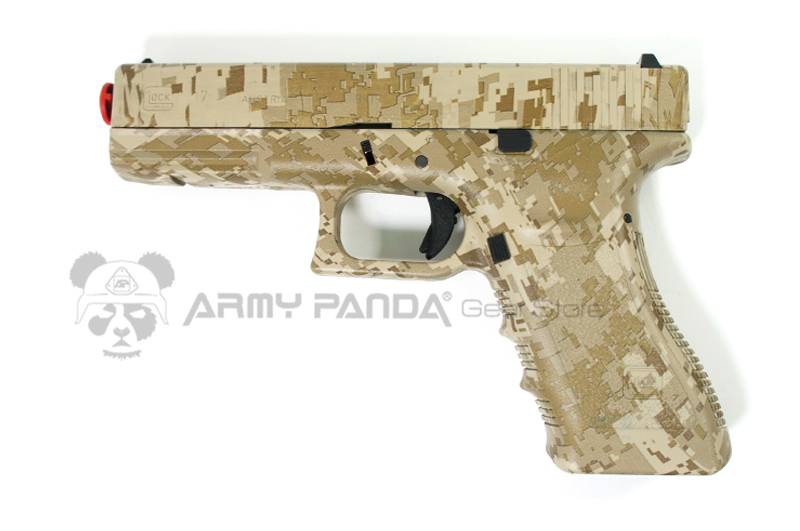 Army Panda special custom based on Tokyo Marui Glock 17 - Water-Tansfer series. Our water transfer Series is high quality, scratch resistant, both durability and performance are remarkably superior to the comparable substitutes in the market, it will survive in long conditions of direct exposure. This product is available in a whole line of different camo schemes including Digital Desert, Digital Woodland, ACU, Multicam and A-TACS. Hop up chamber is installed in this Marui 17, it's accurate and powerful! Click the button below to add the Army Panda Custom G17 CNC Metal Version - (Digital Desert) to your wish list.